Since its inception over 30 years ago, the mountain bike industry has been in a state of steady and drastic innovation. The release of new technology has never slowed down, and every couple of years a new “game changer” is released. Clutch rear derailleurs, such as Shimano’s Shadow Plus and SRAM’s Type 2, are just one of those game changers. It’s one of those ideas that’s just so simple and effective that it makes one wonder how on earth nobody had ever thought of it earlier? What these new derailleurs offer is a much quieter ride and far fewer chain derailments. I believe they deserve a place up on the mountain bike part hall of fame beside hydraulic disk brakes, suspension forks and dropper seat posts. 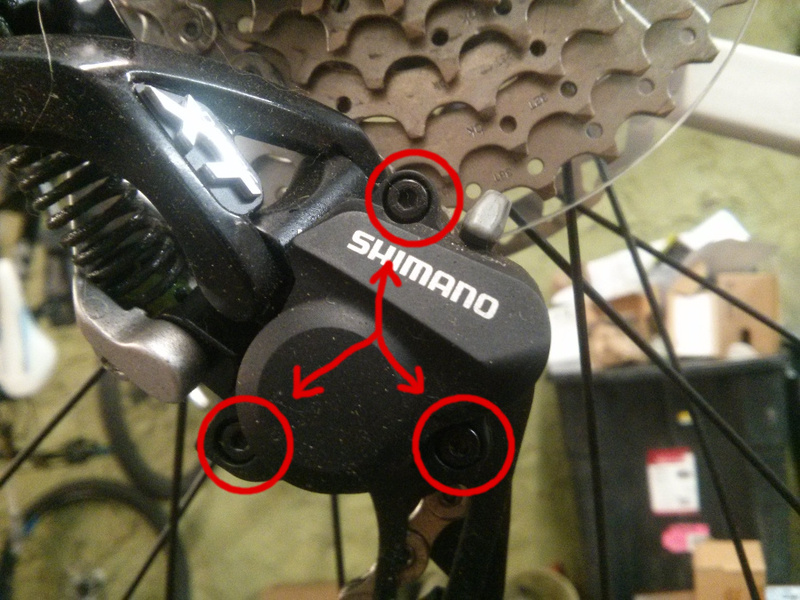 What I’m sharing with you in this post regards only those clutch type derailleurs from Shimano. If you have a Shimano Shadow Plus Derailleur, (Plus – meaning clutch,) you have the option to adjust the amount of friction controlling the forward movement of the derailleur cage. There are several reasons why you may wish to do this, basically involving finding the happy medium between ultra tight chain retention and super smooth shifter action. The higher the friction in the clutch, the better it will keep the chain from slapping around your frame and falling off your chainrings. That’s a good thing, but the friction in the derailleur cage can also make for some severe friction at the shift lever when shifting up the cogset to lower gears. 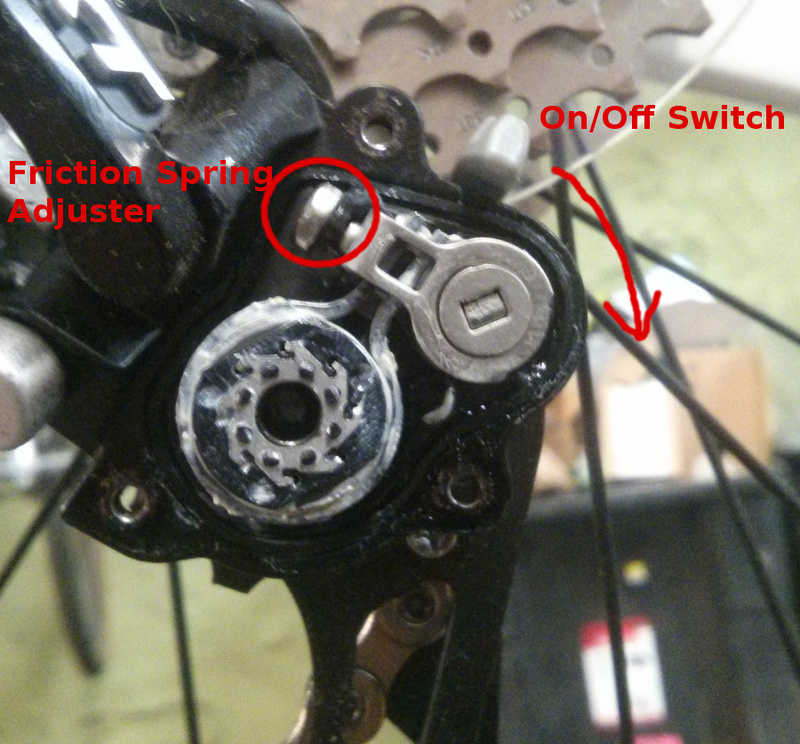 Even after being set-up perfectly from new, the friction on the clutch can simply change over time, so giving us the ability to adjust this mechanism is a sweet move on Shimano’s part. Now that you know you can adjust this, and have some idea of why you might want to, let’s get started. It’s mega simple! The friction is created by a metal band, called a friction spring , wrapped around a small one-way roller bearing. A small set screw adjusts how tightly the friction spring binds around the roller bearing when the switch, (a cam that pushes the spring ends together,) is in the ON position. The mechanism is accessed behind a plastic cover by removing three screws with a 2 mm allen key. Once inside the mechanism, you will see the metal band surrounding the roller clutch. You’ll also see a small set screw on the left side of the band and the switch actuated cam on the right side. At this stage it’s best to flip the switch down into the OFF position to release most of the tension on the metal band. This will make turning the set screw on the left a little bit easier. All you need to do to make adjustments is turn that screw, (clockwise to increase tension, or counter-clockwise to decrease it,) using a pair of needle nose pliers. Flip the switch to the “Off” position to make the friction adjuster easier to turn. Turn the adjuster screw clockwise for more tension or counter-clockwise for less. Check the tension after making an adjustment by turning the switch back into the ON position and pushing forward on the cage, making sure that it requires some force to get it moving, yet feels smooth once it brakes free. Also take the time to shift through the gears and ensure that the friction at the shift lever is tolerable. From time to time you may need to apply a little grease to the outside of the clutch where it slides against the metal band. Once you’re happy with your setting, re-install the plastic cover and voila! Great shifting, a quite bike and a chain that won’t fall off! so when ridding should i leave it on or off or is it personal preference? so when ridding should i keep it on or off? Thanks for your sharing, i think this article must be share to other people.